It’s so easy to let the spirit of Christmas escape your grasp, to give in to the consumerism and advertising and become jaded and angry. I remember as a child always anticipating this time of year. First, we got 2 weeks off from school. Secondly, we got presents. As a family we would go out and get the Christmas tree, bring it home and decorate it. Then we’d stay up late on Christmas Eve drinking hot chocolate and listening to Christmas songs around the warmth and glow of the wood stove. Christmas morning would find all us kids awake at the crack of dawn and peering into the living room at the tree; gazing in awe at the wealth of wrapped gifts that adorned beneath. We’d grab our stuffed stockings and build up an incredible sugar high as we waited for Mom and Dad to wake up and stumble groggily into the room so we could open presents. However, for the past several years the glamour and that indescribable “special” feeling of Christmas seems to have faded away. I started to notice that the Christmas decorations were put up in the stores just a bit earlier every year. Christmas changed. Or maybe Christmas remained the same and it was me that changed, or rather my perspective. Or maybe the world changed. I don’t know but whatever happened I didn’t like it. There was too much consumerism and marketing for my taste. I began to sour on Christmas and no longer looked forward to it. The past several years have been difficult. I haven’t felt the Christmas spirit which forced me to try and fake it for my kids. It’s also a sobering time of remembrance of the passing away of my grandmother who departed this world on December 22nd 2005 at the age of 97. Every Christmas she would bake this incredible variety of cookies. I’ll never forget those tasty treats. My favorite was white chocolate covered pretzels. The spirit of Christmas is so much more than just one day a year. Since starting this blog and beginning to plan this sabbatical adventure I’ve had the great honor and privilege to get to know some incredible people who are doing some pretty cool things. Friendships have been built and I am truly thankful for the connections that have been made. This holiday season I’ve come to realize that Christmas is so much more than just one day a year. Maybe I’ve realized this all along but have only been reminded of it yet again. It’s not about how we live our lives for one sacred day of the year. It’s how we choose to live our lives each and every day. So in honor of Christmas I wanted to highlight a few people/organizations that I’ve become aware of recently and the great things they are doing. The first is Doug Mendel who runs the Douglas Mendel Cambodian Relief Fund. Doug is a former volunteer firefighter who visited Cambodia in 1997, fell in love with the place and saw a particular need that he knew he could fill. Doug donates firefighting equipment to fire stations in Cambodia. He’s even shipped a donated fire truck to Sihanoukville Cambodia! All donations allow firefighters in Cambodia to do their jobs in a safer and more proud manner. Recently I had a comment on this blog from Judy Alvarez who currently works in the Peace Corp in Guatemala in the Healthy Homes Program. Judy recently posted an article on the problem of frequent illness (among other things) and often serious burns from wood burning cooking stoves and the prolonged exposure of families to smoke and open flame. The implementation of improved wood burning stoves can change a family’s life for generations by reducing disease and death from acute respiratory infections. Life expectancy improves an average of 10-15 years per family member. It also uses less wood which is good for the environment and the deforestation taking place. Check out her blog and the work she is doing. Many of you are probably familiar with the charity that Chris Guillebeau works with called Charity:Water which brings clean water wells to impoverished villages around the world. 100% of publicly donated money goes to the water projects. Did you know that almost 1 billion people do not have access to clean and safe drinking water? Contaminated water results in 80% of all diseases and results in more deaths worldwide than all forms of violence including war. I think the war we should be fighting is the war to get access to clean water for every person in the world. My good friend Mark Powers of Powers Percussion recently started The Donating Drummer to let his music give back to the community. Each month readers can submit an application that answers the question of “What would you do with $X dollars?” Mark then takes his earnings from one gig, performance or recording to fund his favorite submission. He announced the winner for December earlier in the month. I think this is just a fantastic way to take something you love doing and give back in a unique and interesting way. Finally we really like the organization Doctors Without Borders which is an International and humanitarian organization working in over 60 countries. They provide medical care to victims of war and disasters regardless of race religion and politics. I can’t think of a better cause to support. The fact is there are many individuals and organizations out there that are making a real difference in the world on a daily basis. I often wonder if I am doing enough to make a true contribution or have I been more like Scrooge was before he had his spirit induced epiphany? The power of one individual is enormous. Yvon Chouinard, the founder of Patagonia, said “To do good, you actually have to do something.” The power of one individual is enormous. Just look at people like Doug, Judy and Mark to see what one person can do. This Christmas let’s vow to share our unique and special powers with others not just on Christmas day, but throughout the year. From our family to your family we wish you a very Merry Christmas wherever you may be and wherever your travels may take you. “It’s not about how we live our lives for one sacred day of the year. It’s how we choose to live our lives each and every day.” A-men, brutha! Thanks Nina! We wish you a fantabulous Christmas as well. You’ve been a true inspiration this past year. So happy to have connected with you. I work in a small retail store that sells hams. We only have two computers. I’m sorry the line is so long but we are working as hard and as fast as we can. I’m sorry you have to stand in a line. I’m sorry you had to stand in a line at the last store you were in. I’m sorry your life is so busy that you can’t get everything done fast enough. With people in this country and other countries going hungry on Christmas I’m sorry we didn’t have exactly the size ham you wanted. I’m sorry you think our prices are too high. I’m sorry you think you can be rude because you are so stressed during the holiday season. But most of all I’m sorry that you have forgotten the meaning of Christmas. Everyone is in such a rush these days. What seems to be lost in the sea of “me” is the concept of “we”. But then I meet people who are doing awesome things and I am reminded that the world is what we make of it. I know tomorrow will be better for you because it’s your birthday! I have been thinking about this lots to matt. I actually did 95% of my shopping online so as to avoid busy malls. Even Saturday’s are full on rush hour during the holidays. It irritates me but I will have to ask my parents because I think the whole consumerism thing has Bren happening wince I was a kid 15-20 years ago. I would have massive amounts of presents and now I don’t like to ask for anything. Kids around me seem to get everything they want year round anyways. Thanks and merry Christmas ! Matt! It’s been great getting to know you, and I’m happy to say you are one person I will never forget your name. 🙂 Treasure the time with family and friends. Merry Christmas to you and your family! The older I get the harder it is to feel that fantastic Christmas spark. This year, even though my family knows I am going on a trip, they insist on buying me things I don’t need. If I had asked them to donate to a charity I’m afraid they would have been offended. I don’t understand it. Don’t buy me anything! Spend your time helping others! Sometimes I think it is a lost cause. Hi Erica! As a family we have been forgoing presents for several years now (adults that is, not the kids) and instead donating what we would have spent to a charity of our choice. One year my sister gave us gift certificates to Kiva (my first introduction to Kiva). Another year my Dad purchased a goat through Heifer.org. This year we have not purchased many gifts for our kids because we don’t want to add to the clutter we are working hard to downsize for our sabbatical. I hope you guys have a fantastic Christmas! I’ve come to realize that I like Christmas…the being with people, sharing food and drink and company, the lights and decoration…the tradition. But not the consumerism…and that piece has become more an more annoying over time. A few years ago we stopped giving gifts and giving to a local organization instead – that was a good switch. This year we have upped our contributions – I have learned this year of how incredibly lucky we are and how, really…I don’t need so much. No TV this year either means no inundation of Christmas selling ads – that has helped a lot. 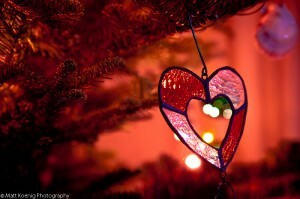 I want to like Christmas and making these changes and realizations help me like it again. Merry Christmas to you and your family Matt! Cheers! Thanks Gillian! Merry Christmas to you and yours!! I love the parts of Christmas that you mention, the people, the food the lights and decorations. Every year we drive around the neighborhoods looking at all the light displays. There are several in town where you can park and tune your radio to a certain station and watch the light show to music. We need a lot less than we think, despite what all the advertising tells us. Wishing you all the best this Christmas! My family has been embracing less and less commercialism each year and more and more family time. Maybe it’s because we’re fully grown we finally appreciate it. Hi Ayngelina! This Christmas we really cut back significantly. Our boys only received 2 presents each unlike in years past and guess what!? They said this was the best Christmas ever. Thank you so much for mentioning the stove project! It was a wonderful Christmas surprise to see that one of my favorite blogs mentioned my work here in Guatemala. Wishing you and your family love and joy during this holiday season! Hi Judy! Your writing about the stove project and the work you are doing with that really touched me. To think that something as simple as an improved stove can make such a significant change in a families life is amazing. I wish you the very best for the New Year. Happy Holiday to you and your family! I don’t think you have changed. I think my feeling for Christmas has been the same every year. Just another wonderful time to spend with your love one It’s the sales and the marketing that make it feel so commercial now days which I don’t like. Every Christmas, I try to find the perfect gift for my fiance. This year we decided not to give each other gift but singing the song from Mariah Carey “All I want for xmas is you” to each other and make a fool out of our self but we love the spirit and joy more then the gift. Thank you Sarah! Sounds like you had a fantastic and memorable Christmas. I think you should post a video of you singing. 😉 Happy New Year to you!